What did you eat for Christmas dinner? 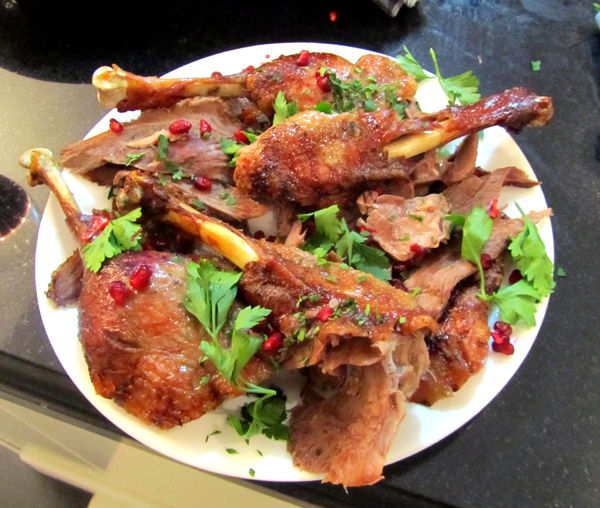 I cooked a free range, Moldovan village goose. I remember cooking a goose once, in the US, when our offspring was young. They didn’t want anything to do with it, culinary heathens that they were. They wanted turkey. So this year I saw my chance and decided on a goose. There are lots of them roaming free here in the countryside in Moldova. It was delicious, but it didn’t have as much meat as I had expected. I ended up with plenty of good fat though, which I am keeping and may make presents of to foodies and nutrition fans, if I can find them! Apparently it is very good for you, and it’s widely used in cooking in the south of France. And we know how unhealthy they are (not). I have now a supply to last me for years, so sharing seems like a good thing to do. And if you did not receive my Holiday Greetings, here they are. What did you eat for Christmas dinner? Do you have good recipes using goose fat? They have several advantages: (1) They cannot be factory-farmed, so any goose at all will be free-range and tasty (2) There is not much meat on them, as you found, but this means there are no endless leftovers; three days and ours was all gone (3) You get all that yummy fat which cooks the world’s best roast potatoes. otoh they are fairly expensive. No more turkey in our house – it’s dull beyond words. We always have home-raised turkey for Christmas, delicious. But next year we hope to start rearing geese. Goose fat is great for all sorts of things. Rub potatoes with it before roasting and they’re very tasty. My husband uses goose fat to fry the beef for a bourguignon. And of course you can always cover yourself in it and swim the channel! I’ve never tried goose, but it looks lovely. We had turkey, ham and duck. Happy new year! How do they fatten up those chesters? Not with hormones, I hope! I just googled it: It’s the result of a genetic selection project. Anyway, that Sicilian cassata, now there’s something fabulous: Just about everything sinfully delicious together in one cake! Must be really good! I’m going to look for a recipe. Happy New Year! Yes, that’s exactly what I thought when my friend explained what a chester was… but oh well, the “normal” chickens we get here every day at the supermarket are no different – I like to call them, “anemic” chickens for their total absense of colour (or taste). The cassata is indeed to die for – instantly in a figurative way, and slowly in the literal sense, especially if you eat it too often ahaha. I can send you my recipe for cassata – it’s quite simple, not as elaborate as the traditional ones tend to be. I am home with the family for christmas and many of them are Samoan. We had three kinds of meat, taro, fish, and coconut cream all cooked in an umu, a kind of earth oven. It’s traditionally made by the men so I just made a salad and relaxed. What an interesting lunch, and what a wonderful idea that the men have to cook it. Thanks for the goose fat link. Happy New Year to you and yours! We had a wonderful Danish frokost (lunch) with sild, (pickled herring) medister polse (some veal and pork sausage) rodkaal (red cabbage) etc. No goose fat recipes from me. A pity it’s not foie gras. I also cooked “rodekool” (red cabbage) for Christmas dinner to go with the goose. Traditional foods are fun to cook for the holidays. With your French background I thought you might have some experience with goose, and I thought goose was traditional for Christmas in Denmark.